This holiday season is the time to be festive, creative, and loud! To reflect the celebratory mood, most houses go all out with the decorations. If you’re a holiday-loving homeowner you might be thinking hard about what to do this year for your house, including your rooftop. Luckily, there are many great and unique rooftop ideas you can try this Holiday Season. Whether it’s snowing or not, or whether there are carolers about, a shining rooftop will be the envy of everyone in the neighborhood. Here are five unique rooftop ideas for the holiday season. Create a vibrant and even over-the-top experience with these lighting and design ideas! Nothing says it’s the holidays more than a version of Santa and his reindeers landing on your roof. You can choose to install two-dimensional, well-lit models onto your roof. A lit-up sled and Santa Claus are sure to impress the neighbors (and maybe take a toll on your electricity bills). You can also go for lightweight three-dimensional models if your roof is strong enough to handle them. If you close your eyes and think of the holidays, you’ll recall the taste of hot chocolate, the smell of cinnamon, and the sight of cute gingerbread houses. Take it one step further by turning your home into a giant gingerbread house. Keep it colorful with large lights outlining the roof, doors, and windows. For the rooftop, you can add giant peppermint, lollipop, and other candies. They can line the edges of the roof or even be securely fastened to the roofing tiles. Whether it’s snowing or not, you can recreate the holiday experience by adding fake snow onto your yard, and onto awnings and the roof of your porch. You can also add falling snowflakes coming down onto or from the edges of your roof. You can channel the ultimate Christmas spirit by laying a giant lit-up star on your rooftop. Strings of light can connect the rooftop star to the rest of the house and create a shooting star effect. It will definitely guide neighbors and curious travelers to your home. You can keep it both simple and over-the-top with a single-minded rooftop design. Covering the whole roof with colored lights can catch the attention of anyone, and also help light the way during the night. A bright rooftop can be your only decoration this holiday. With that as your highlight, you don’t require a lot of coordination with other decorative pieces in the yard. Before you can start decorating and styling your roof for the holiday season, you need to consider safety and stability. Many things can go wrong if your roofing materials are in disrepair, or if there are holes or missing shingles. Improper installation can also cause damage. Begin working on your unique rooftop ideas by contacting a professional repair and maintenance roofing company. 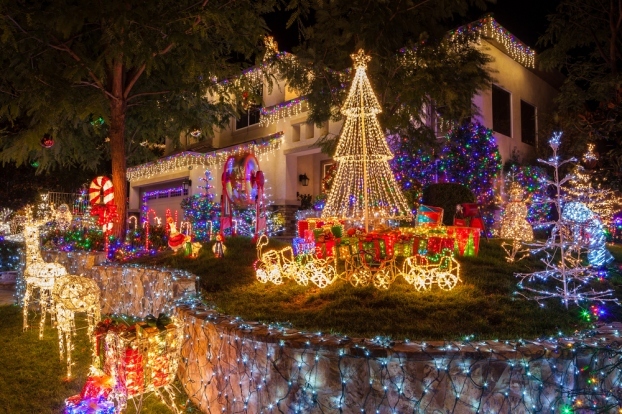 They can advise you on how to properly install the lights and decoration you have in mind. Contact your roofing contractor today!